Chicago Bicycle Accident Lawyer | Illinois Bicycle Lawyers at Keating Law Offices: Chicago Tribune Profiles Chicago's "Critical Mass"
Chicago Tribune Profiles Chicago's "Critical Mass"
Today's Chicago Tribune provided a profile of Chicago's Critical Mass. The article is pretty fair, it points out that Critical Mass causes a lot of congestion and clogs traffic. It also points out that drawing attention is the point of Critical Mass and, as anyone who has every ridden knows, it is a lot of fun. As for the legality of Critical Mass, strictly speaking the rides themselves are a violation of just about every Rule of the Road. By definition, the Critical Mass riders do not yield the right of way, stop for stop signs and stoplights, stay in their lane, nor ride as close to the curb as is practicable. 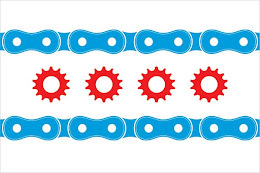 As discussed on IllinoisBicycleLaw.com before, bicyclists in Illinois have a duty to follow all of the rules of the road. While Critical Mass is the subject of a lot of scorn from drivers and the impatient, in my opinion the Critical Mass movement is a great example of the effectiveness of non-violent protest and an exercise of the 1st Amendment. While many Americans can readily tell you that the 1st Amendment provides for Freedom of Speech, they forget that our founding fathers also wanted to protect our ability to freely assemble and to protest government policies. In a very basic sense, Critical Mass is an example of both. "Congress shall make no law respecting an establishment of religion, or prohibiting the free exercise thereof; or abridging the freedom of speech, or of the press; or the right of the people peaceably to assemble, and to petition the Government for a redress of grievances." (emphasis added).